Eggplants are delicious vegetables, very common on summer table. Deep fried, salad,stuffed,pickled ,they can take any form and fit with almost all ingredients. One of the most tasteful ways to cook them is with a tomato and onion sauce at the oven. Eggplant are bitter. Before start cooking them it is necessary to slice them into thick slices and put them into salted water for at about 1 hour. Cut onions into thick slices and cook them slowly with olive oil . Add garlic cut into small pieces and cook a little bit more. Take the dish and put some of the sauce on the bottom, and put a layer of eggplants. Put some sauce and repeat. When the the sauce is thick and the liquids are gone, add feta cheese and let bake for another 5 minutes. 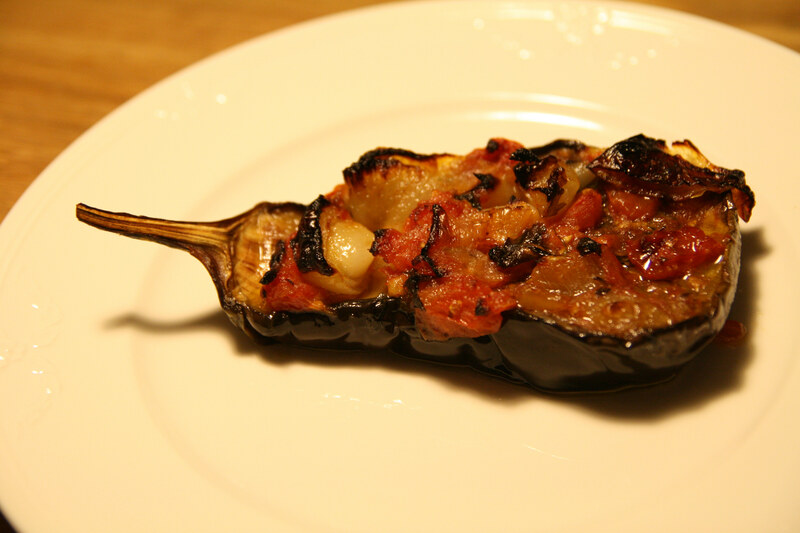 Many people which could not eat eggplant loved this dish and they still eat it. Try it, it really worth to taste it. Baklava is very traditional dessert not only in Greece ,but all around east Mediterranean countries. 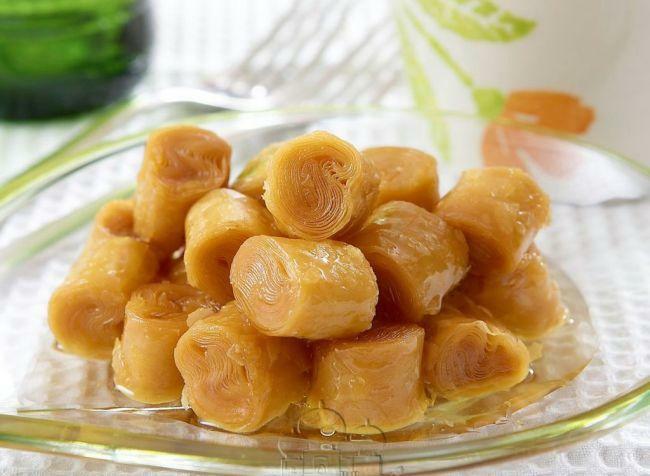 Made with fillo dough and dried nuts, is very crispy and full of syrup. The secret of success to baklava is butter. You must use the best quality butter you can find and you will need a really big amount of it. Important is to have all ingredients ready because you will need to work fast. Fillo dough when opened starts getting dry and it breaks. There are 2 types of fillo. the thin and the thinner. Best is the thinner . For one pack of fillo for baklava you will need 600-700 grams of high quality butter (cows butter). If it is very thin repeat and before rolling add the rolled fillo and roll again. Cut into pieces at about 4cm and put them at a medium deep dish. Repeat until fillo is finished. The size of the dish is important. Pieces must be tight inside the dish. Cover the pieces of baklava with the remaining melted butter. Now, when Baklava is still very hot drain from butter very well. This sweet must not get inside a refrigerator. Put some pieces over ice cream. it is very crispy and flavorful . try them by their own. You will love them as they are. During summer watermelon is one of my favorite fruits.Cold, refreshing, full of water, it really makes me feel good. But , there is a problem. A normal watermelon is at about 12-16 kg. Sometimes we cannot eat it. You will need some hours to prepare it but it worth it. Weight it and for every 1 kg of fruit add 300 grams sugar. Let it stay for 1-2 hours ,so the water comes out. Start boiling in high heat. Boiling will take longer than usual jams because of the quantity of the water. When you boil watermelon there is not a nice fruity smell coming out. It smells more like a boiled cucumber. So, when the marmalade finally, after hours of boiling start to get thicker, add some rosewater to the mixture. When the jam is thick seal it into hot sterilized jars. 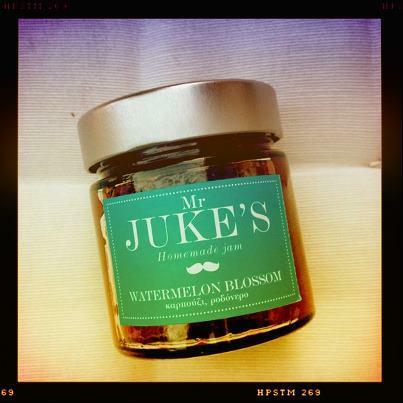 Watermelon marmalade has a deep red color, a crunchy feeling and because of the rosewater it smells awesome. Try to make it and tell me your opinion. Greek summer is hot. Some times extremely hot. Some times temperature rises up to 42 -45 C .
What can you eat with that heat? Compine Greek yoghurt with fresh fruits , cereals,walnuts, add some honey, and you have a refreshing and very nutritional plate. What do you know about Greek Yoghurt? Rich, creamy and tart, Greek yogurt is a decadent dream for you if you often crave healthy snacks. This diva of dairy goods is gaining more and more popularity, as nutritionists and health experts around the world agree that snacking on Greek yogurt is an incredibly smart and gratifying choice. Here are five wonderful reasons why. The trouble with snacking is that a lot of the things you probably like to eat are high in fat and cholesterol–two things that can cause trouble for your heart, if you eat the wrong kinds.Greek yogurt takes the guesswork out of the equation; you will not be wondering if the fat and cholesterol in your snack are okay to eat. A 6 oz. serving of Greek yogurt contains 0 g of saturated fat and cholesterol. This means you can eat as much yogurt as you want, without putting your heart in any danger. Greek yogurt is made from a highly concentrated form of milk, so you’re actually getting more calcium per mouthful than you would if you drank a glass of fresh milk. The composition ofGreek yogurt averages at about 20 percent calcium, making it an effective bonestrengthener. This also makes it an ideal choice to get the extra calcium that you will need later in life. Greek yogurt can count itself among high satiety index foods. Many dietitians agree that foods with high satiety indices, such as tuna, bring about more gustatory satisfaction than others, pound for pound. This means that 6 ounces of Greek yogurt will make you feel fuller than 6 ounces of clear soup. Even if you eat exactly the same amount of each, Greek yogurtsimply feels more satisfying than soup, making you eat less of it in comparison. If you are a bodybuilding buff, you will be glad to know that Greek yogurt is also 30 percent protein, making it a rich source of muscle-building material. Combined with its low-fat properties, this makes it a tasty, guilt-free treat for you. Another thing that makes Greek yogurt great for snacking is that its flavor is flexible enough to allow for a wide variety of tasty and healthy toppings. 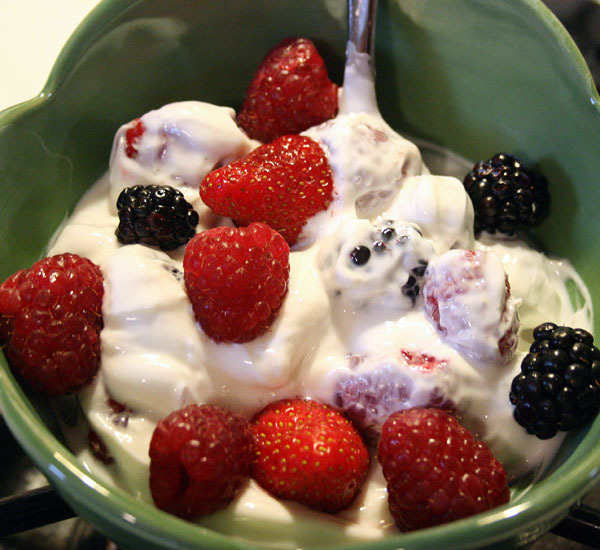 If you are in the mood for something fruity, you can mix in your favorite berries with Greek yogurt for a zesty dessert. Breakfasts are both creamy and crunchy when you’ve got granola in your yogurt. 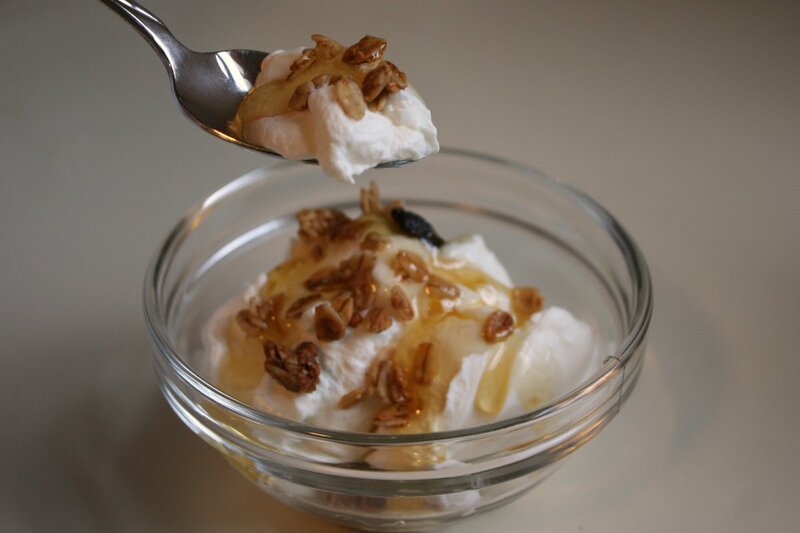 If you’re looking for something simple to wind down with, a spoonful or two of honey makes Greek yogurt taste divine. Not only do many foods taste good on Greek yogurt, but Greek yogurt also goes great on other foods. Try it out as a dressing on your next salad. Bring out your saucepan and dazzle your taste buds with Greek yogurt pasta sauce. Use it as a sauce for chicken, beef or fish. The world for experimentation is wide open with Greek yogurt. The only limit is your imagination. So, when you visit Greece, remember to eat yoghurt not only during the extremely hot days of our country. You will love it and probably when you return home will continue eating it. Greek Yoghurt can be found at more than 45 countries worldwide.